A hat to combine two, okay three, of my favorite things: Chickens, stranded colorwork and wool! 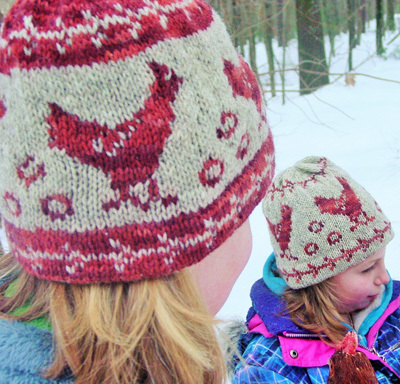 Rhode Island Red features a provisional cast on, lined brim and stranded colorwork. 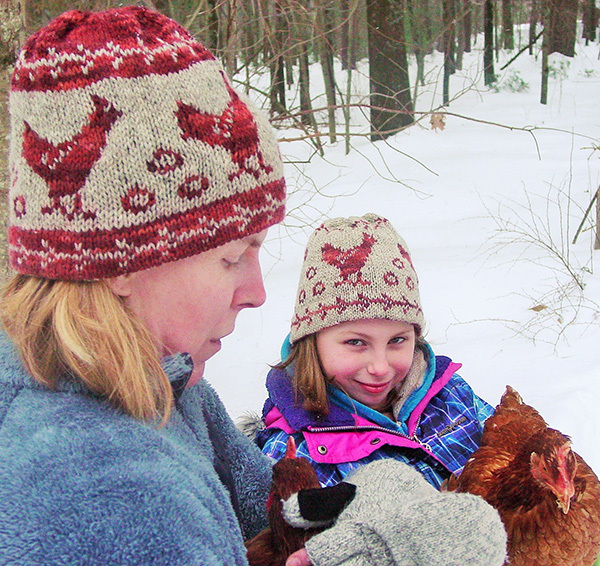 The yarn for this hat is from Romney Ridge Farm in Maine. I knew I wanted to do a chicken hat but hadn't found just the right yarn and had almost given up hope. I saw this yarn and eureka, my chicken hat came to life. I was able to make 2 hats out of 2 skeins of yarn. The hat begins with a provisional cast on to create a double-layer brim for extra warmth. I also wanted to have the extra space from not having ribbing to add a motif along the bottom edge. The hat begins with a provisional cast on. Use your preferred provisional cast on technique; directions for one technique may be found here. Stitches are picked up along a crochet chain and worked for 3 inches. The work is folded up and a row of decreases is used to create a double layer of fabric along the brim. Note that colors are used differently for the different sizes. Pay attention to which color is used. Choose a size with approximately 1 inch of negative ease. With scrap yarn, provisionally CO 90[100, 110] sts. For first size, join Color B, for second and third, join Color A. Place marker and join for working in the round. Work stockinette stitch (k every round) for 1.5 ins. For first size, join Color A, for second and third, join Color B. Do not cut the other yarn. Knit 2 rounds in Color A[Color B, Color B]. Next round, establish chart: Work Chart A 18[20, 22] times around. Work as set until Chart A is complete. Knit 1 round in Color A[Color B, Color B]. Joining round: With right side facing, fold work so that wrong sides are together and provisional cast on is parallel to work on needles. Carefully remove provisional CO to expose a few stitches at a time, placing them on a spare needle. Hold spare needle parallel to circular needle and work a k2tog with one stitch from each layer. Continue working in this manner to end of round. Bottom hem is now complete, 90[100, 110] stitches on circular needle. Next round, increase: With Color A, [k9, m1] around. 100 sts. Using Color A, k 2 rounds. Next round, increase: With Color A, [k7, m1, k8, m1, k7, m1] 5 times. 125 sts. 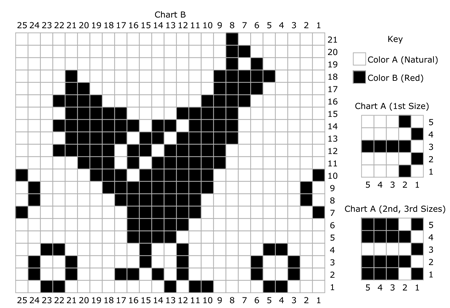 Work as set until all 21 rows of Chart B are complete. Knit 4[2, 2] rounds in Color A. Work even in Color A[Color B, Color B] until hat measures 7[8, 8.5] ins from bottom edge. At this point, you can cut the unused color. As you work the following rounds, change to your small circumference method when hat gets too small for circular needle. Rnd 1: [K3, k2tog] around. 80[80, 104] sts. Rnd 3: [K2, k2tog] around. 60[60, 78] sts. Rnd 5: [K1, k2tog] around. 40[40, 52] sts. Rnd 7: K2tog around. 20[20, 26] sts. Break yarn, leaving 6 inch tail. Using yarn needle, draw tail through remaining stitches. 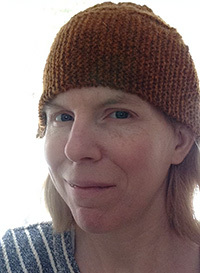 Pam Sluter is a knitting designer and teacher living in Rhode Island. 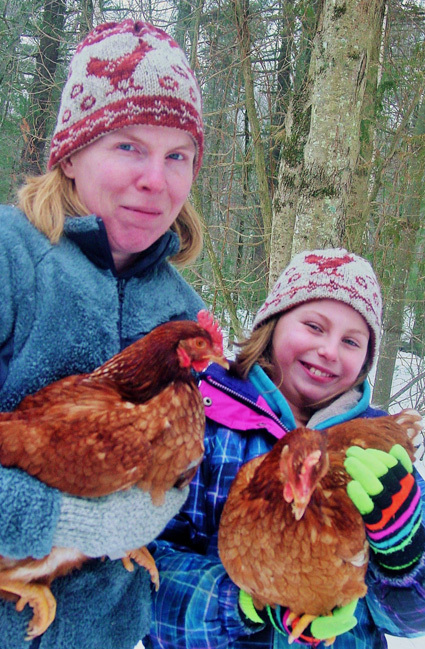 She enjoys the company of her husband, four children, two dogs, two guinea pigs and six chickens. She enjoys working with natural fibers and has a weakness for small farm yarns. She is currently at work on an e-book collection, Knit Fresh Rhode Island, featuring yarns produced in Rhode Island. You can find her on Ravelry and on the web.